With a local guide in 4 hours of walk. Good condition physical necessary. Discovered fauna and flora of the island. Meeting with inhabitants of the small hamlets located in the mountain. 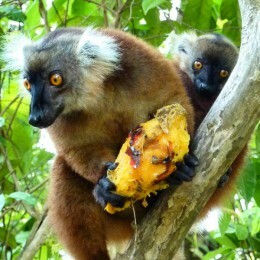 Visit of village of Ampangorina and reserve of lemurs, discovery of local arts and crafts. Typical meal taken in the village, at the edge of water with a very pretty sight on the surroundings. Discover the beaches and their sea-beds. Visit Ampangorina village and the richness of its craft. Snorkling on the superb funds of the small island of Ambario Be. Meet with the craftmen manufacturing pirogues.